Woman calls police after her friend bends her fingers back in Vero Beach. 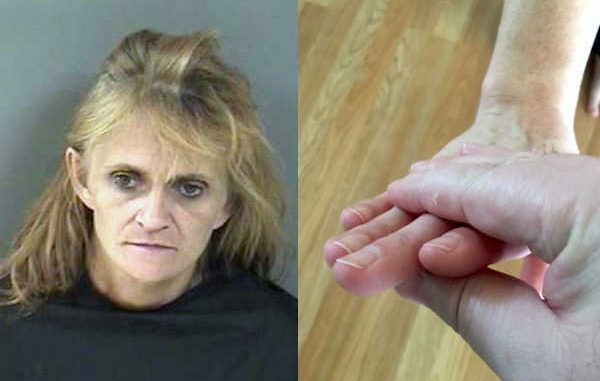 VERO BEACH – A 48-year-old woman was arrested in Vero Beach on charges of battery after she twisted her friend’s fingers. The Indian River County Sheriff’s Office was called five times at a residence on 7th Avenue in Vero Beach for multiple disturbances. At 2:37 a.m., deputies responded to another disturbance call at the same location where a male and two women were heavily intoxicated. The victim told deputies that one of the women, identified as Patricia Diane Powell, “grabbed her fingers and twisted them, causing pain to her fingers,” according to the report. The victim said she was outside listening to music with her boyfriend when “Patricia came outside from the house and grabbed [her] fingers and twisted them,” the report said. Patricia Powell was arrested and transported to the Indian River County Jail where she was charged with battery.